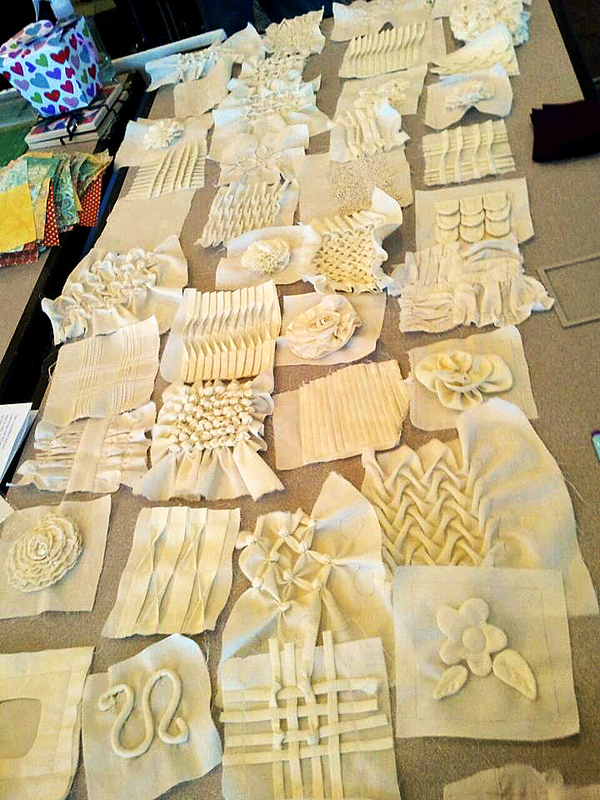 Experiments in Dimensional Sewing – Cheryl Sleboda – Textiles. Technology. Texture. Teacher. Learn unique techniques that will enhance your next quilt! These vintage sewing techniques will raise the surface of your quilt and truly impress. We’ll learn heirloom smocking techniques, tucking, ruching, and lots of other fabric manipulations, and then we’ll cover how to put it into a block in your next quilt. Whether you are a traditional, contemporary, art, or modern quilter, you can add a cutting edge, yet classic, look to your next project. Great for beginners and experienced sewists. You can choose classwork that is done without a machine. This class is customizable to be a half day, full day, or multi day class with or without sewing machines! Please contact Cheryl for more details. Supplies needed: 10 8″ squares of good cotton fabric in solid or solid like colors plus one fat quarter, a clear plastic ruler at least 8 inches long (like Omnigrid rulers), a fabric marking pencil (light or dark) that shows up on your fabric of choice, thin long hand sewing needles you are comfortable with (I like Jeana Kimball Straw Needles #11), strong thread to match your fabric (I like 40 or 50 weight threads), scissors, and a group ironing board and iron to share.